You are here: Home / HSA News / The HSA Needs YOU Next Year! 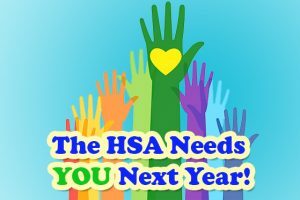 The HSA Needs YOU Next Year! It’s time to choose the 2018-2019 HSA Board. We are seeking interested individuals to throw their hat in the ring for positions that will be opening up for the 2018-2019 school year. Positions are available for elected leadership positions, appointed leadership positions, and volunteer committee chair positions. Everyone is encouraged to submit their interest for any and all positions that interest them. Please see the list of positions and their descriptions… see something that sounds fun or is right up your alley? Submit your interest using the form on the page. Please submit your nominations by April 30! Click here to view positions and nomination form!